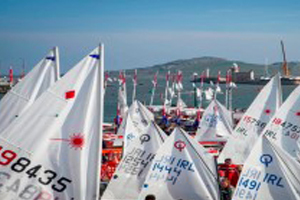 Well done to all twenty of our Laser radial and 4.7 sailors who competed in difficult and tricky conditions at this years ISA Youth Pathway Nationals in Howth last weekend. The RCYC was again very well represented in the radial class by Tara Coveney, Jamie Tingle, Eoghan O Regan, Richard McGinley, Billy Duane, Charlie Moloney, Ronan Walsh & Johnny Durcan. The overall winner of the radial fleet was Conor O’Beirne with Johnny Durcan in a brilliant 3rd place followed by Ronan Walsh in 9th. Turning to the 4.7 fleet, we had twelve sailors competing (and making up almost one third of the entire fleet).This was the first competitive event for many of our sailors which saw the overall title going to Henry Higgins. Chris Bateman led the RCYC crew with a great 4th place followed by Rebecca O Shaughnessy in 7th and Tom Keal in 10th . All other sailors including Paddy Cunnane, Amy Carroll, Molly Murphy, Maeve O Sullivan, Caoimhe Foster, Cian Jones, Lucy Donworth, Robert Carroll and Patrick Daly sailed excellent races and did us all proud. We will be resuming Sunday morning training on April 17th at 10 am hope to see you all there.